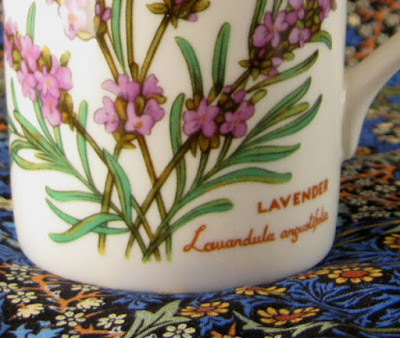 Antiques And Teacups: Tuesday Cuppa Tea, Lavender Festival Weekend Coming UP! 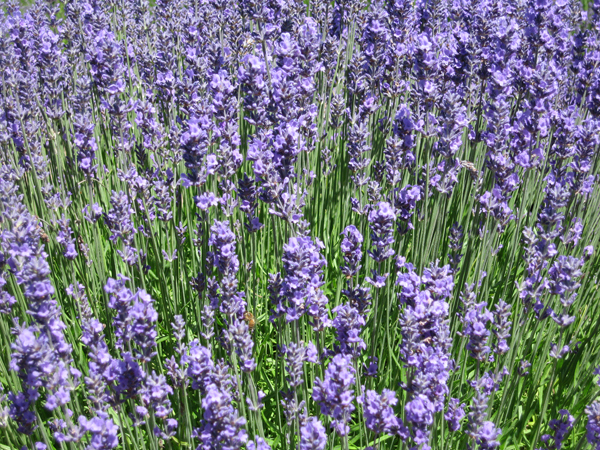 How fun- a lavender festival! I so enjoyed my recent lavender picking in Oregon and having a festival around it would be a great event. Love this year's poster. I collect that style of naive art. The lavender themed tea was well put together as far as the table setting and menu. So nice to see the lavender theme really carried through. Glad your husband's infection is gone. So glad your hubby is okay now. Loving all the lavender and the interesting post. 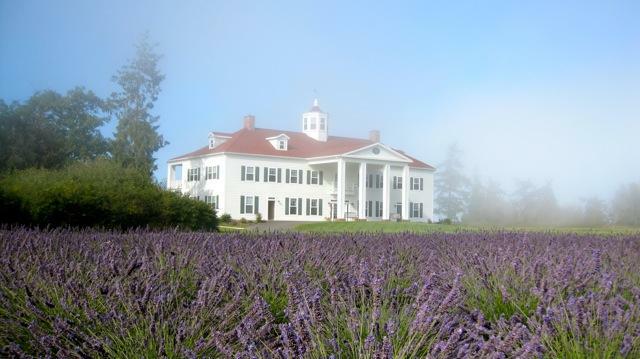 It is so sweet that you took the time to share this lovely, misty Lavender Festival with us. It is most important that you two take care of yourselves. An outing sounds like the perfect remedy. BTW your website is simply beautiful. How wonderful that your hubby's health has improved and that the infection has gone. The lavender festival sounds like such a fabulous event and the tea you attended looks out of this world! I look forward to seeing more picture, Ruth. Thank you for having us to tea, even with your hectic week that you had. Ruth, I am so glad your hubby is feeling better! They are a worry when they are not well, that's for sure! 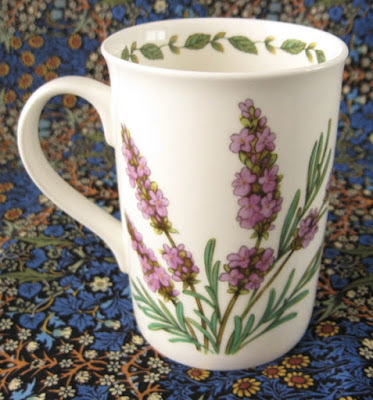 I love your pretty mug and oh my, those fields of lavender are incredibly gorgeous. A heavenly fragrance must greet you there. The tea room looks fabulous and how lovely they treat you with a packet of lavender to use in making your own tea biscuits. Thank you for your interesting post and hosting your party even though you have been very busy. Have a beautiful day, my friend. I am so glad that your husband is feeling better and that the infection is gone! This post was so interesting. I love lavender and would love to attend such a festival. I live in St. Petersburg and have a very difficult time growing lavender. I am on my fourth try. I love the poster of the festival. It looks like it belongs in a child's story book. So glad to hear that your husband is well on the way to being well ... yeehaw! One day I'm going to make the lavender festival in Washington. Love the mug. Fun post. Happy Tea Day and thanks for hosting! That lavender festival looks fantastic.... love all the photos! And that lavender tea - oh my goodness! If we weren't on the other side of the country, we would definitely be attending this event! I'm happy to hear that your husband beat the infection. Hopefully, you can now both enjoy your summer. The Lavender Festival looks so much fun! Wished that I lived closer so that I can attend it! I'm drawn to exotic flavours so I was intrigued by the English Lavender Raspberry Black tea! Wonderful! 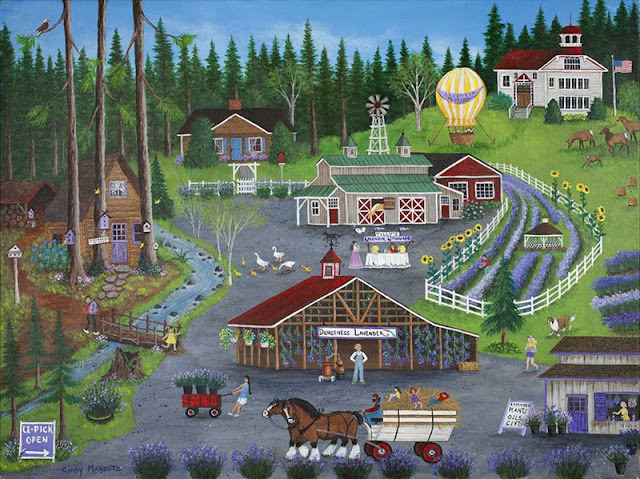 I do miss PNW terribly---all the misty fog and fields of lavender, tulips, and more! Not a lot of that in Northwest Arkansas! Ha! Thanks for providing great photos from home! I have never heard of the George Washington Inn. How beautiful! 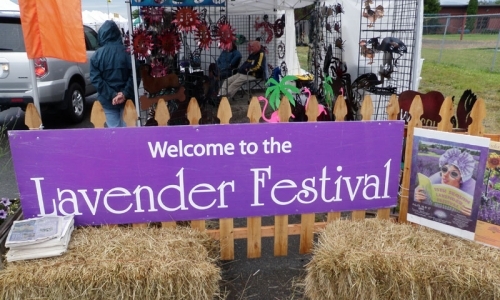 I do love the Lavender Festival in Sequim and wish I was going to be in the area for it. Enjoy! Beautiful spot. Scrumptious tea. Perfect afternoon. Glad to hear your husband is doing better. 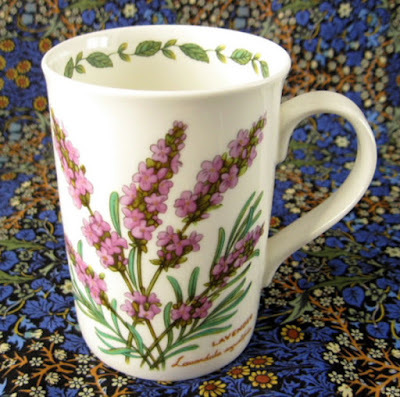 I would love to attend a lavender fair that included a tea! How exciting to go in and see the tables set up and the menu was delectable. Get well wishes for your hubby! How beautiful the lavender fields are! Great festival and love your post... so interesting! Happy your hubby is better dear Ruth. Thanks for the sweet tea party. Oh my goodness Ruth, this is my kind of place. 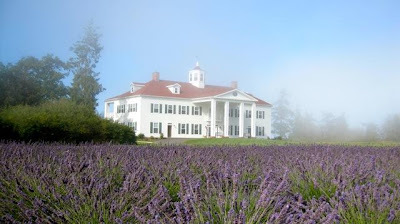 A lavender festival and tea at this gorgeous estate?? What a dream. Everything looks gorgeous. 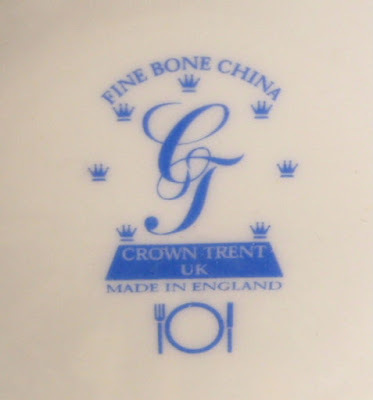 I especially love that delicate lavender china on the table. So so pretty. Thank you for taking us along. Happy cuppa tea Tuesday. Ruth that Inn is a beautiful location for tea and a festival! Thanks for hosting! What a fun way to spend the day. such a pity it was so foggy and wet on this particular day. I'm glad to hear your husband is feeling better. That tea menu looks so delicious! Oh Ruth, what a delightful place to visit! Another blogging friend shared her experience at a Lavender Festival and it was the first I had heard of it. How I enjoyed your lovely pictures and seeing the fields of lavender....my, what beauty! Thank you for joining Roses of Inspiration this week - you have been missed! Love and hugs! Ruth, how I wish I'd been there! I've always wanted to visit that part of the country, and this would have been the perfect occasion for me. All the photos are wonderful, but I especially like the one of the barn in the fog. Fog is my second favorite weather, after rain. The Lavender fields are lovely, great pictures even with the rainy day! This lavender festival sounds like a dream! I would like to see and visit (and eat!) everything you showed. What a delightful post! Sorry to arrive here so late to comment on last week's posting which you did. The food looks incredible at your Afternoon Tea. What lovely little savory pies. I think you timed it right for your adventure and what a sweet posting. Hi Ruth, hope your hubby is feeling better! 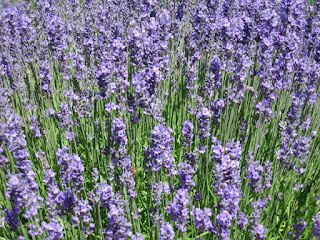 I love lavender and have attended a festival here in UT before and it was a lot of fun. The poster is darling and it sounds like a fabulous time! 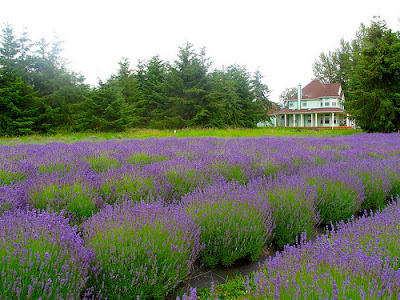 There's nothing quite like the sight of a lavender farm. Thanks for sharing with SYC.